Based in Russia, with over 100 years of ammunition manufacturing experience, Tula Cartridge Works is a world-renown producer of quality, steel-cased ammunition. 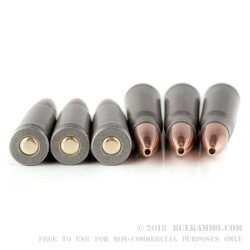 Created out of necessity, as a more economical option than brass, steel-case ammunition has become a favorite of both foreign militaries and the commercial shooter. Made for the AK or SKS platforms, these 7.62x39 rounds are Berdan-primed, non-corrosive, and non-reloadable. The ammunition comes with a polymer coating for better feeding and ejection, as well as moisture resistance for long term storage. Equipped with a 124-grain hollow point projectile, their price and reliability make them ideal rounds for a day at the plinking range, while the hollow point gives them the oomph they need for self-defense scenarios. 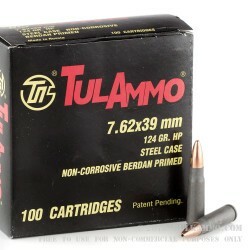 If you are looking for a cheap, high-performing 7.62x39 mm round, look no further than Tula Ammunition. This product contains 1000 rounds of Tula steel-cased ammunition. A: Thank you for your question! Here at BulkAmmo.com we want to make sure our customers are armed with knowledge as well as standard arms. 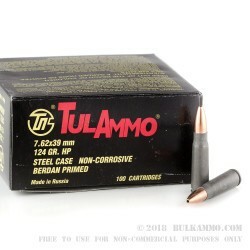 More and more ranges are banning ammunition that has steel content and unfortunately Tula uses steel in the bi-metal jacket which will be picked up my a magnet. This is currently true for all Tulammo products and most items in a steel case.